For those unable to attend the WE HEART JAPAN — WEHEARTJAPAN.COM — event in Hollywood, CA on Saturday, October 1st from 5-8pm, we thought we would bring a little of the event to you, courtesy of this exclusive interview with WE HEART JAPAN’s founder, Stephanie Sheh, anime voice talent, director, writer and producer. And if you live within a 3-4 hour drive of Hollywood and you are an anime and voice actor fan, and you haven’t decided about attending the event… are you kidding me? 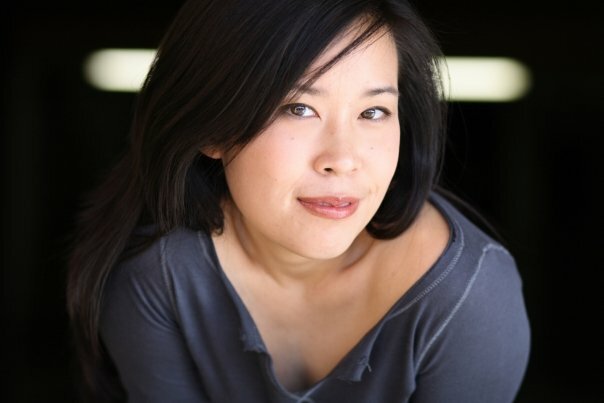 Why would you want to miss out on a live performance by award-winning singer & songwriter/anime actress Mari Ijimi (Macross), and a Cowboy Bebop U.S. voice cast reunion and live episode reading featuring Steve Blum, Melissa Fahn, Beau Billingslea, Wendee Lee, Mary Elizabeth McGlynn, and Stephanie Sheh. Seriously. Go and be a part of this historic event and a great charitable cause — all proceeds are being donated to the Japan NGO Earthquake Relief and Recovery Fund. You can purchase tickets online at WEHEARTJAPAN.COM. And if you are unable to attend but would still like to make a donation, you can make inquiry through the website. Q: You’ve had the opportunity to voice characters for some of the most popular anime series in the last decade. Which one was the greatest challenge for you, and why? STEPHANIE: They’re all challenging in their own ways. Penny from Zatch Bell was challenging because it was vocally straining. Silky from I’m Gonna be an Angel was hard because you had to convey tons of emotion in just [one] word lots of times. Then there was probably the most challenging one, which was a job I got fired from. I was so new to voiceover at the time that I understand what happened. It was a traumatic experience, but it was all for the best in the end. Q: You have the distinction of having been a cast member in two of the oddest, quirkiest, most bizarre anime imports ever to be dubbed for English audiences: “FLCL” (aka “Fooly Cooly”) and “Bobobo… with a bunch more Bo-bos.” When you first auditioned for these shows, what were your first impressions? And after you were cast, did you ever imagine the scripts could possibly get any stranger or more ridiculous? STEPHANIE: Well I produced FLCL so I knew what I was getting myself into. I understood FLCL‘s craziness. It was actually this beautiful complicated piece about growing up and letting go. There were so many themes about loneliness and adolescence. But then again, I can say that ‘cuz it’s like I studied FLCL. With Bobobo, I just came in and voice acted. It seemed wacky funny. I couldn’t tell you if it was about anything deeper though. Not to knock it or anything, I just didn’t have the relationship with that show as I did with FLCL. You’d probably have to ask Michael Sorich [for] his take on it. STEPHANIE: There are a million nice things I could say about Kari and Epcar. First of all, I hired Kari in her very first anime voiceover role. So it is so cool that I’ve been able to watch her career grow and take off. Kari is one of the most humble and smart girls I know. She really deserves all the success she has in her life. I adore her and I don’t get to hang out with her enough. The truth about Richard Epcar is that he makes the best martinis in Los Angeles. He is a real decent guy with integrity. He’s another one of those people I am blessed to have become friends with through work. That entire family is talented. Q: Media Blasters recently announced “Bakuman” for release in November. Are you at liberty to talk a little about the series and the character you are voicing? And does Media Blasters seem at all concerned about any potential confusion with “Bakugan”? STEPHANIE: I am really loving the show. It’s such a great premise and coming from a fan background I love it. I remember when I would try to use screen tone. It really takes me back to my college days and when I was an otaku. Q: You have a lot of script editing and adaptation to your credit for a number of anime titles. When you are deep in a project like that, how do you take a break from it? STEPHANIE: Uh…I don’t. I try to power nap. It’s super tough. I guess that’s why I am always wanting to travel and go on vacation ‘cuz all the other times I work sooo hard. Q: So the “We Heart Japan” charity group/event is your baby, and it’s such a great cause. After the first event in March, what made you decide to do another one in the same year and how did it come about? Are you already planning future events, and if so where/when? Also, have you visited Japan? STEPHANIE: I’ve visited Japan many times. And I owe so much to that country. I am an actress because I got my start in anime. I have so many friends that I’ve met through work. I love so much about Japan and it breaks my heart that so many people have suffered due to the disaster that occurred. I have visited Japan many times. And I know I will go back again. I wanted to prove to the world through my charity group that anime fans can give back. Recently there has been a lot of bitterness in the industry towards fans because so many fans steal their anime by downloading illegally and it is a fact that the illegal downloads are killing the industry. That said, I wanted to focus on the positive. I believe that anime fans have generous hearts and can rally together to help the people less fortunate. So why not do something for the community and help out. It was the least that I could do. It is sooo much work and none of my friends who are working on it are getting paid. We all do it to give back to the community. The October 1st We Heart Performing for Japan Show is going to be epic. Everyone who does not go will without a doubt regret it. For the first time in over a decade the original cast of Cowboy Bebop is returning to do a live reading of an episode. We also have singer/songwriter Mari Ijima performing songs. And we have ex-Power Ranger performers Dan Southworth and TJ Rotolo doing a fight demo on what it’s like to be a Sentai Supervillain. Their demo is gonna be so much fun. It involves audience participation. There will also be refreshments, autographs, raffle prizes. Every ticket comes with an exclusive We Heart Japan postcard that has original artwork from Gurren Lagan that was drawn solely for our charity group. That means you will not be able to find this artwork in any book or purchase it anywhere. You can only get it by coming to one of our events. The event is from 5pm-8pm and it’s only $40. I really really really hope people turn out for it. And if you can’t make it to Hollywood please tell your friends about it. I heard some people may be getting friends together and taking a road trip. It would totally be worth it. Stephanie also did recent interviews with The LA Times, the Anime News Network, radio station 98.1 The Fan, and the One Piece Podcast.